both in Thailand and abroad. For a prestigious event, please let “KLO” be part of your memorable moments. ขอบคุณมากนะค่ะ. เพราะมาก. ประทับใจมาก. ขอบคุณ klo มากๆๆๆๆนะค่ะ. 'TOP AGENT AWARD 2015', last Friday. It is very much appreciated. You and your team are stars !!! Once again, thank you so much for the great work on Saturday. Everyone was raving about the string quartet and the opera singer (especially him!). Thanks so much for fabulous performance during my wedding. I heard many songs I requested played during I took photo with my guests and wished next wedding I'll be a guest got KLO to perform. Led by violinist during entering the ballroom and cutting cake with bubbles and -You and Me- song was really what I had in mind. Special thanks to k.Pink and the violinist and the band to make it come true. Thank you very much for the performance on my wedding reception. and I would like to apologize that I was very occupied and cannot give the musicians a warm welcome. video clip ไวโอลิน 2 คน เปิดตัวบ่าวสาวเข้าสู่พิธีการเพลง "All I Ask of You"
Many thanks to the band na krub. Everyone says the music was fantastic. Thank you very much for making our day full of your lovely songs. It was so nice ka. Thanks again for every concern you share and for the nice song you played. The character of Khun Pink is cute and understanding. Not regret at all for choosing you "Well done ka "
It was happy, funny and amazing event krub. Many surprise there and I really appreciate it! Thank you so much for fantastic songs on my wedding day na ka. So much thanks for nice team on my wedding day ka. Very enjoyable and Impressive. ... We would like to thank you for fabulous music in our ceremony krup. Also, we are appreciated and prompted to recommend your band to our friends in the future. Thank you and your team again for helping to make our wedding such a memorable experience. แต่ยังแอบวัยรุ่นอยู่ ถ้ามีคลิปของ 2 เพลงนี้ ช่วยเอาลง youtube ด้วยนะคะ อยากฟังซ้ำๆ อีกค่ะ ขอบคุณมากๆ อีกครั้งค่ะ"
requested, which made our day that extra special. excellent service that you have continually provided to us. I’m happy to say that the Bangkok Chef Charity Gala Dinner was a great success. which everybody enjoyed, and they’re now looking forward to the next one. 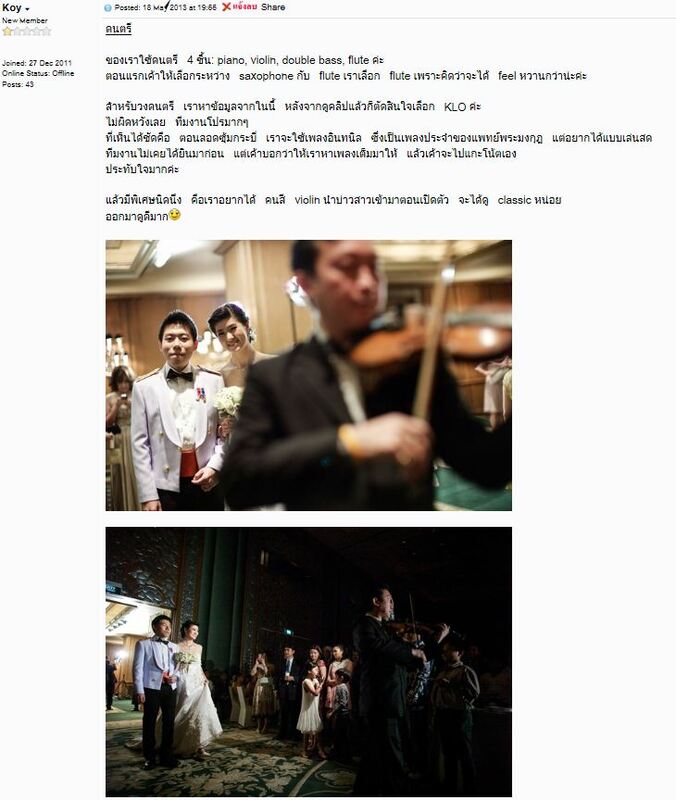 On behalf of the team, I want to thank you and the Krungthep Light Orchestra for your kind support of the event. The musical programme selected for the evening was so wonderful, and together with the KLO’s professional performance, it has made the event a complete success. I hope that this event is only the beginning of our growing cooperation for future event in making a meaningful contribution to the lives of less fortunate members of Thai society. in the North. As the Thais are fond of saying, good deeds like this bring only good things in return. May your and the KLO’s generosity in giving to this charity event bring good things to you and your family. Thanks so much for everything ka. The guests loved the music and I appreciate your comments and suggestions on the songs. Will highly recommend to my friends ka. Thank you so much for the KLO music. You are so professional- I didn't have to worry about the band at all. Just some phone calls and emails. Our guests were impressed by the beautiful of KLO string quartet. It really charmed and spiced our wedding. Thank you again for playing at our wedding. ผมก็ happy ด้วยผมไม่รู้จะตอบเเทนยังไง ได้เเต่ฝากมาบอกว่า "ขอบคุณมากครับ"
Thank you very much na ka. Most people complimented KLO band to me at the end. We would like to say thank u for all that u had did that is wonderful. Every quests (crazy farang)of us so impress about the songs. Thank u so much naka to shine up our wedding !!! * One thing we know we choose the right one reallyand i would like to advice KLO ka. We used them service before and we are all very satisfy..!!! I use KLO for our wedding and everything running perfect. They show them work before and also we choose the style of song together. KLO team arrives in wedding on time, i just can say one word !! perfect as professional !! ขอบคุณ..คุณพิงค์ และ นักดนตรีทั้ง 5 ท่าน ที่มาได้ตรงเวลาตามที่นัด.. Thanks for much for the music na ka. Mark's family really love the music. so there were no dance after. and I guess we will have dance there for all the Canadians. Thanks again for the last minute help for music at our wedding ka. 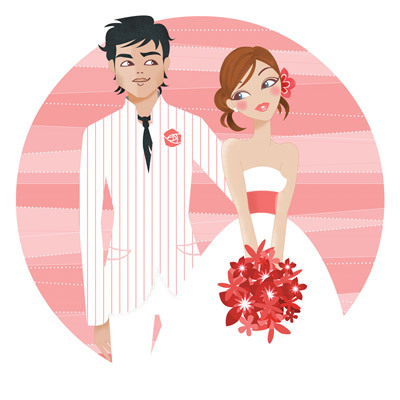 We want to thank you and your team to add the color to our wedding party at Merchant Court on Feb 27. My husband family enjoy the music very much. All the guest also keep asking me where to contact your team. I already told them about your company. Thanks again for all the effort and good music on that night. it will not be that perfect without your commitment. My wife and myself will like to thanks all of yours kind supports on that day. According to my wedding on 13th Mar. I'd like to thank you KLO for a very appreciate music on that day. Our guests appreciated your music very much. We are back in the state. And I'd like to thank you and KLO for a wonderful performance on our wedding day. Many people have mentioned that the music was excellent. Hello ka Khun Pink ! Just want to say thank you na ka for your wonderful services and special thanks to your team. Most of my friends say ...the music was great on that night. Sorry to kept you wait until late and didn't have time to chat with you much. I have not seen any pictures yet, if u have some please show me na ka. Again, thanks you very much ka. Thank a lots for the wonderful music at JW Marriott Hotel. Many of guests applauded with your play. That’s made us really happy with their satisfaction with our night. and I am glad if you would appreciate downloads the nice night in your website. Anyway please let me see the picture before you download it. We'd like to thank you once again for the excellent performance on our very special day. The guests were really happy about the music, and the evening wouldn't be completed without KLO. and contribution from KLO and yourself. a music band in their wedding. 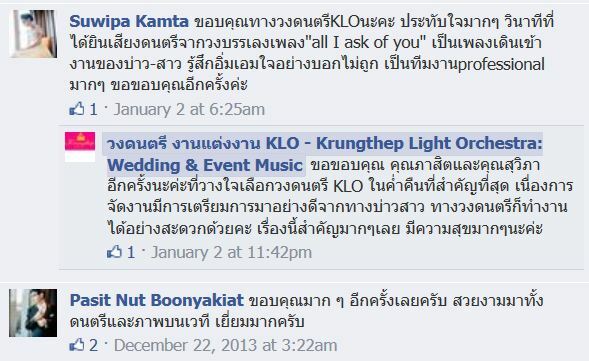 In general, we can say that KLO have done a good job..ka ! I highly recommend this band for anyone's wedding reception. You won't regret having this KLO band in such a day. We had 5-piece band of KLO last month at Regent Hotel.